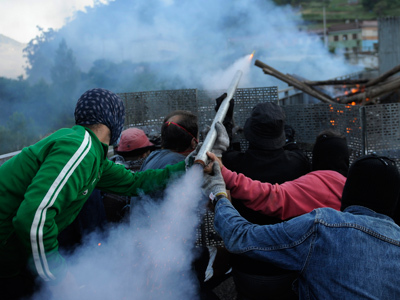 Police fired rubber bullets at some 200 miners protesting austerity cuts in the northern Spanish village of Cinera. 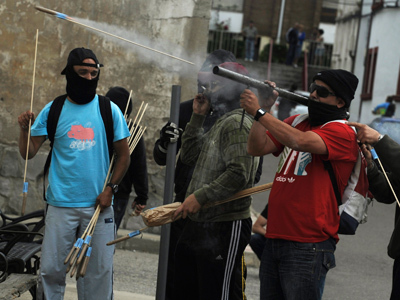 Demonstrators, in turn, attacked the police with stones, firecrackers and rockets fired from homemade bazookas. ­Havoc erupted after police tried to remove one of several barricades set ablaze by protesting masked miners on a highway near the village. Several men then attacked the police by launching rockets from homemade bazookas, hurling firecrackers and flinging stones with slingshots. It is unclear how many miners and policemen were injured in the clashes. Several mining towns and villages have been protesting the Spanish government’s plans to slash subsidies to the coal sector by over 60 per cent, from 301 million euro last year down to 111 million this year. 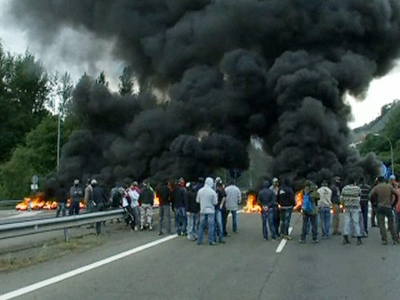 A sector-wide strike has been declared, and rail and road transit was paralyzed in the northern Asturias and Leon provinces as miners set up makeshift barricades composed of burning tires, garbage containers and railroad ties. Union officials say the austerity measures could jeopardize the jobs of around 8,000 coal miners, and up to 30,000 people indirectly employed by the sector. The Spanish government has implemented a number of unpopular cost-slashing measures to reduce its swollen budget deficit since Prime Minister Mariano Rajoy took office last year.